Can your town save the earth? Here is how your town can cool the planet and save money doing it. 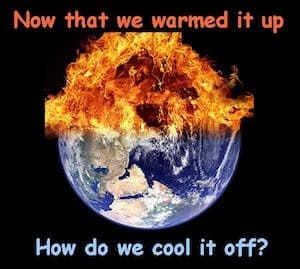 The earth is heating up at an unprecedented rate. Tropical diseases are appearing in American cities. Every summer is more unbearable than the last. Massive fires devastate our forests. Someone just sailed a pleasure boat through the once frozen “Northwest Passage” connecting the North Atlantic to the North Pacific via the North Pole. What is being done? At Paris in December 2015, 196 countries signed a “game changing” climate agreement that recognized the threat climate change poses to humanity. Their solution? Slow the rate at which we are heating the atmosphere. This is a good idea. But it will not solve the problem. It is like slowing the car as you hurtle toward the missing bridge over a deep gorge. You buy time – but you are still going over the edge. Solutions that actually cool the earth’s atmosphere. Scientists tell us that the main culprit in global warming is carbon in the form of CO2. This is why trees are so important and why global deforestation is a key part of global warming. Trees remove CO2 from the atmosphere through photosynthesis. They release the oxygen (O2) back into the atmosphere for us to breathe and use the carbon (C) to build cell walls. As long as the tree is alive, it soaks up C; together trees in a forest become a “carbon sink” holding carbon that cannot contribute to global warming. The problem with this is obvious – trees die and when they do, they rerelease the C into the atmosphere as they rot. This is where your town comes in. Your town has hundreds, perhaps thousands, of trees lining streets, shading parks, beautifying public buildings. Every year these trees shed branches, need pruning or die. Every year you collect hundreds, perhaps thousands, of tons of dead wood. What do you do with it? Burn it? Chip it? Compost it? Landfill it? No matter what you do with your dead wood, you are returning the carbon to the atmosphere. You can do better for all of us – and for your town. What is biochar? Super charcoal, pure carbon without the ash and impurities in basic barbecue charcoal. Why is biochar special? Let’s start with the earth. Making biochar is carbon negative. When you make biochar from dead wood, you permanently remove carbon from the atmosphere. The biochar that remains when you finish production is pure carbon equal to 40 percent of the total carbon contained in the wood – and it is completely inert. It will never again enter the atmosphere. Put differently, for every pound of biochar you make, you remove three pounds of CO2 from the atmosphere. Making biochar also has important indirect impacts. Large piles of rotting wood chips, for example, emit not just CO2, but methane, a greenhouse gas (GHG) 25 times as warming as CO2. Methane and other such long-term GHGs as NOx are eliminated by pyrolysis. The question you have to ask, however, is: What about my town? It is one thing to care about the environment; it is another to impose the costs of solving global problems on local rate payers. Here is the irony: Making biochar will save your town a lot of rate payer money. That is the point: Making biochar is smart business for your town, not just good for the environment. Where and how much your town will benefit depends on local circumstances, but here is how making biochar can cut costs. Biochar is a powerful soil amendment. Applied to lawns, playing fields, golf courses, it can reduce fertilizer costs 40-50 percent. Biochar retains water extremely well. It can reduce time between watering by days, conserve water and save money. Biochar is a highly effective decontaminant. It can be used to clean up hazardous spills, decontaminate building sites, storm drains, and lawns and public spaces after floods. Biochar added to compost – if the town composts leaves, for example – improves quality and extends the effective life of compost in the soil. If your town is large enough – if it has enough stuff to turn into biochar – biochar production can itself be turned into a profitable endeavor by using the heat it produces to run a small power plant. The amount of power involved may be tiny, but providing free electricity to Public Works is no small matter. Bottom line? Why not help the earth? Your rate payers will love you – and your town will take pleasure in knowing that global welfare lies at the heart of how you do business. Dr. Shafer is the co-founder of Warm Heart Worldwide and director of the Warm Heart Environmental Project. He lives in Phrao with his wife Evelind and their 40 adopted children. A one time Environment Assistant Minister, Wangari Mathai of Kenya once said that the Effects of Global Warming would be felt more in Africa. This is what we are seeing in Kenya, Rivers are drying up, Lakes are shrinking and food production is declining. We need to act.